Included: Metal - ONE ( X ) TRUSS Bar Set (Exactly as shown in picture) No other parts Included. For Ozark Trail (Model: FGA1010FMPB) and ABBA Instant 10' x 10' Straight Leg Canopy Gazeboy or any brand have same dimensions and specification PLEASE NOTE:This truss does Not attach to the Middle. It attaches on the corners as shown in picture. 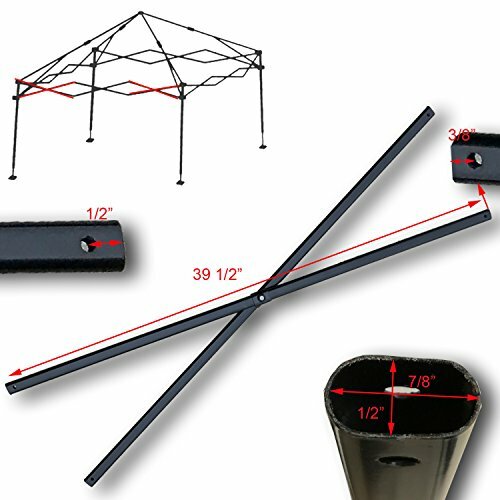 Dimensions: 39 1/2" x 7/8" x 1/2"
Included: Metal - ONE ( X ) TRUSS Bar Set (Exactly as shown in picture) No other parts Included. Dimensions: 39 1/2" x 7/8" x 1/2"